The Madonna di Senigallia was finished by Piero della Francesca around 1474. It is housed in the Galleria Nazionale delle Marche, in the Ducal Palace of Urbino. The art critic Bernard Berenson wrote "Impersonality - that is the quality whereby (Piero) holds us spellbound, that is his most distinguishing virtue". The painting, originally in the church of Santa Maria delle Grazie in Urbino, is quite different from Piero's previous production. The faces still have an expression of aloofness and of superior rational wisdom, but they also convey a sense of precious, almost exotic, beauty. This is one of the paintings in which the artist most clearly reveals his interst in light values, both in terms of reflections and of magical transparencies. 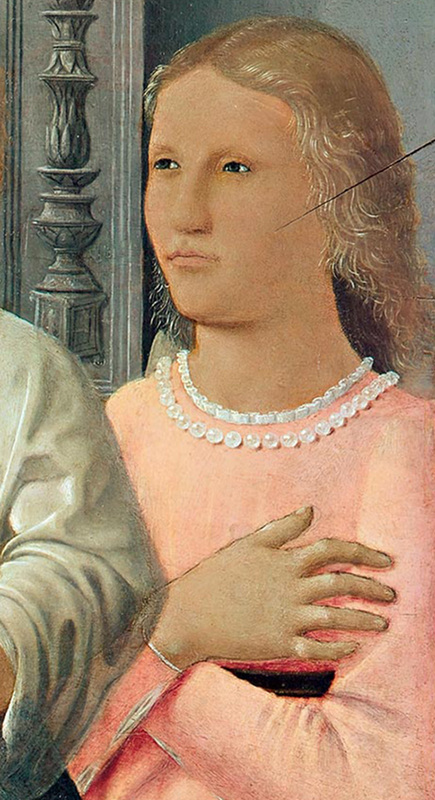 From Mary's veil, slightly puckered on her forehead with subtle light variations, to the coral necklace around the Child's neck, to the angels' shining pearls - these are all effects which, together with the light streaming in from the window, and forming a perfectly geometrical shape on the end wall, will appear again and again in Dutch painting of the 17th century. An influential art historian and critic in the formalist tradition, Roberto Longhi is a unique figure in the history of art. Longhi's two life-long art subjects were Caravaggio and Piero della Francesca.